Jungle Red Writers: A Little Comfort Food. Wow . . . you've certainly been busy, Rhys! I love grilled cheese, too . . . adding bacon makes it a special treat. But homemade macaroni and cheese has always topped the list of comfort foods for me; it's always my first thought whenever anyone mentions "comfort food" . . . . I love broiled cheese, too. My comfort foods are anything starchy - medium grain brown rice with butter or soy sauce on it, mashed potatoes, fresh hot sourdough bread, pasta with pesto. I actually get the Marmite thing, Rhys, being a salt lover. Looking forward to seeing you in a few days! Sausage gravy and biscuits, black raspberry cobbler.... And I totally get the hotel thing, Rhys--after awhile, you just want 'real' food. Honey on a hot buttered popover. Comfort foods, hmmm. That is a particular category for me, which includes pretty much nothing that shows up on the menu in a high end restaurant. Macaroni and cheese, the way my mother made it. Is there a new name for longhorn cheese? Haven't seen it in years. 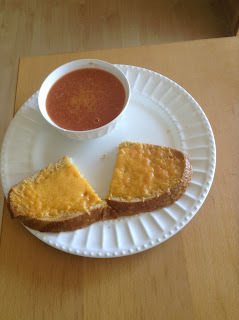 Definitely grilled cheese, made on a grill not under the broiler, and Campbell's tomato soup. This is the only canned soup I ever have in the pantry. I see a Lenten trend up there! By the way, one of you here once said she had an uncontrollable urge to fluff pillows, even in someone else's house. I think of this every single morning when I make my bed although I am pretty sure you will never walk into my bedroom. But I can't be too careful. Ha ha, I can't imagine most of us wanting to fluff pillows, but I'm glad you're ready for anything Ann! Rhys, I was mystified by the evening meals at Christ Church. They were great, but I never understood the serving of custard with supper. I didn't know what to do with it. No matter what was served with the different courses, there was a shallow dish of custard nearby. Occasionally someone at my table would would put a spoonful on their plate, but I never saw anyone eat it. One night I was invited to sit at the head table and was certain that someone up there would eat the custard. No. When I got back to Boston for the orientation week for new students, a girl who had been a Rhodes scholar came to my office to introduce herself. We talked about Oxford and Christ Church. Then she said she had a question about dinner at Christ Church. "What's with the custard as condiment?" It was possibly one of the best connections I made with a student in all the years I was there. Rhys if you could answer the ChCh "custard-as-condiment" question, I would be very grateful! Grilled cheese with tomato (and now I like to add avocado) done in a buttered cast iron frying pan. The best grilled cheese I ever had was in Ireland where they grill the tomatoes first. Macaroni and cheese of any kind, but when in need of deep comfort, nothing beats Patti LaBelle's Over the Rainbow recipe, which has four kinds of cheese, butter, half and half AND even Velveeta. I used to make it once a year. More than that and you need to live with a cardiologist. Oh! I forgot my favorite comfort food! Macaroni Chowder! It's simple: Boil elbow macaroni and drain. Put it back in the pot, and add milk and butter. Heat until the butter melts. Add salt and pepper. That's it. No oyster crackers. Wouldn't want to gild the lily. Leek and potato soup for deep-down soul comfort. What could be better? Almost any soup, as long as it's homemade. Swiss steak with mashed potatoes and red gravy. BLT's. Hard-boiled egg sandwiches, with mayonnaise and salt and pepper. I default to savory stuff, rather than sweet, when I have a craving, and hot food, rather than cold. Oh, this all sounds yummy! Except for the baked beans, which somehow… I never learned to like. If I had my choice of a delicious comfort food? I would have a baked potato with butter, and sour cream. And maybe bacon bits. Yum. Or a BLT sandwich on white toast. With mayonnaise! Maybe even with avocado. And yes, peanut butter on toast. I am also very partial to oatmeal with strawberries and sugar. Or raspberries, yes raspberries, and sugar. Or with brown sugar and raisins. I think we must be keeping the cheese production in this country going by ourselves. Reine. The English did serve custard with most deserts when I was growing up. Jello and custard was a standard. But I think the little fish on the table must have been a Christ Church idiosyncrasy. And baked beans on toast was another childhood food... Things were still pretty austere for about ten years after the war in UK. Food was rationed so the diet was mainly starch and items like baked beans provided protein. Hank. ...l oh yes. Baked potato covered in cheese and butter. Yum. Always loved grilled cheese sandwich. Sometimes tomato soup with grilled cheese sandwich. After I read Winnie the Pooh, I wanted to eat custard and it is one of my comfort foods now. See you at Malice Domestic Conference! Don't you love auto correct? I wrote the little dish on the table and I've just seen it is now the little fish. No fish on dessert I promise you! YUM, bangers and mash and real fish and chips, heaven. A full English for breakfast right up there with a ploughman for lunch. Yes. That's what I think of when I think of the time I spent in GB. Of course I had an illegal job pulling beers at a pub in the Lake District. Food came with the job, as did a room over the pub, but no cash, except for tips. Those of you who lived in Europe during the 1960s and 1970s can stop laughing now. I want you to know, this yank accent...worked wonders for tips. My comfort foods are heavy carbs. Macaroni and cheese, baked till the top is crusty. Creamed tuna and peas over toast. Grilled cheese (both kinds UK and US) creamy custards, even Jello with whipped cream. Oh my, I'm starving! Rhys, it's possible to get pasties in the US. There are lots of places in northern Michigan, for some reason. My son-in-law likes a place in Traverse City called My Sister Jenny's, and he will drive more than an hour to bring back a big sack full for lunch for the crowd. So yummy. Oh, my, how had I forgotten about longhorn cheese? My father, who was the Big Cheese (hehehe, the cheese buyer) in our family, would buy it. I'm wondering if it is called something else these days, too? Just did a quick Google, and since it was Colby Longhorn Cheese, it seems that maybe the longhorn part has been dropped. That would make sense to me, since I usually have Colby cheese in my refrigerator. Comfort foods for me include the grilled cheese sandwich, the BLT (and, yes, Hank, with white toast), homemade vegetable soup, and meat loaf with mashed potatoes. Toast. Toast and tea. Toast with Dundee Orange Marmalade. Toast with good sharp cheddar. Toast with cheddar and tomatoes... Toast with any of the above and a cup of hot milk. For an actual comfort meal, a rotisserie chicken, brown rice, and steamed broccoli. And soups, I love any kind of soup. Bean soup, vegetable soup, leek and potato. I could live on soup. Oh, fried bread in bacon fat..bread pudding with cream. Home made lentil soup with ham bone. Rhys, thank you for removing fish from the dessert list. Custard as condiment pales. (To the tune of "Oh What a Beautiful Morning..."
Rolled, pinched and baked with such soul. And sit in my belly like lead." Rhys, congratulations on your month! As for comfort food... challah French toast, chicken soup with matzo balls, slow-cooked oatmeal with brown sugar. I absolutely love warm custard - I lived in Nigeria (previously an English colony at that point), when I was a kid, and would pour it over trifle, cake, fruit..yum! Also strong black tea with half-and-half and Demerara sugar (preferably in cube form). what a fun question!